The town has a long history. It was originally settled by the Romans and there are excavations dating to that time. 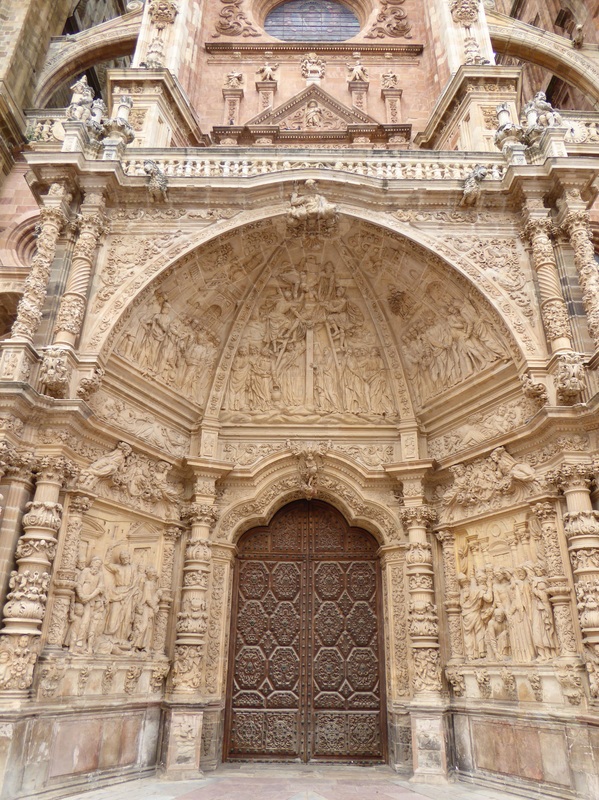 Astorga was sacked by Moors in the 11th century and then rebuilt and endowed with the usual hospices and monasteries. 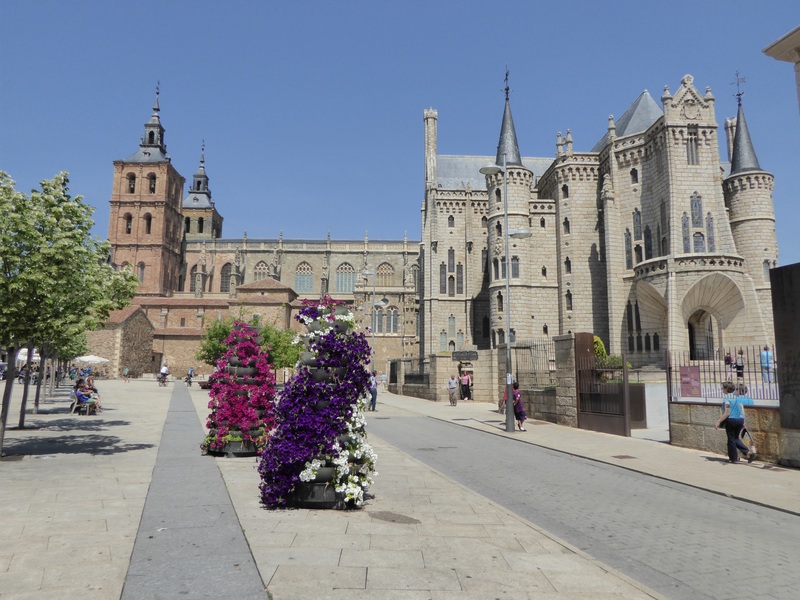 As the pilgrimage lost popularity in the late Middle Ages, Astorga fell into decline. Now, once again it is a vibrant stop for pilgrims—their last opportunity before the mountains to rest and reprovision. It is also the capital of the Maragateria region. The cathedral of Santa Maria is incongruously grand for a town of 12,000 people. 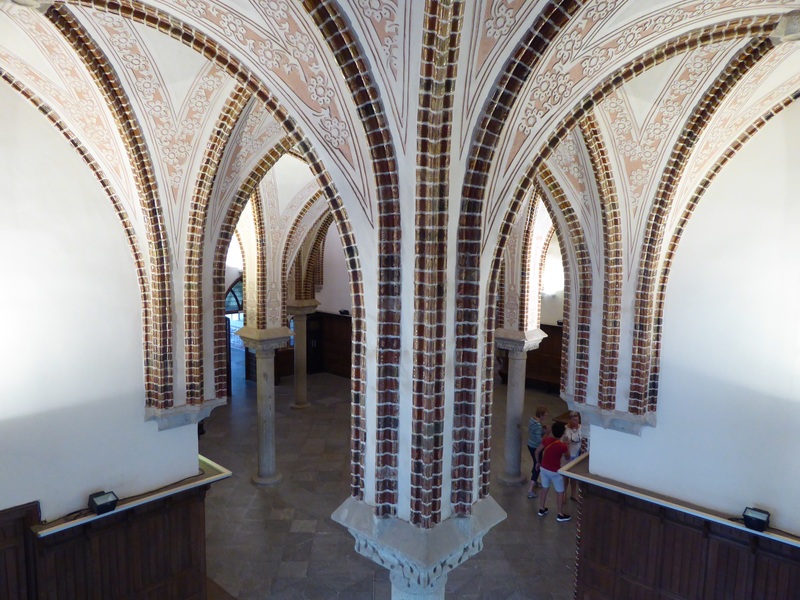 It dates from the 15th century. Today the docents kindly allowed us to place Calla lilies for Bev on the cathedral altar. Across the street from the cathedral is a Gaudi building initially built as the Bishop’s palace. Only two floors were completed by Gaudi but this is another of his magnificent fairy tale castles. The beauty of light filtering through the stained glass of the many churches, cathedrals and basilicas along the Camino give the feeling of being in a giant kaleidoscope. Astorga is famous for pastries called “mantecadas” which are like a dry pound cake, “hojaldes” —sort of a flaky, honey pastry, quite good but very rich. The area is also known for chocolate which we have not gotten around to tasting yet. It does not travel well in a hot backpack. Another favoured meal of the area is called”Cocida Maragato” which has an assortment of ingredients including pig snout, pig trotter, pig ear and goat’s blood sausage. We applaud the not wasting of the pig but decided to pass on this dish. Astorga marks the end of the Meseta and the beginning of the foothills of the Leon Mountains.It is said that the Camino France’s may be divided into three distinct sections, each with its unique challenge. The first is from St.Jean Pied de Port, over the Pyrenees to Burgos. This section challenges the pilgrim physically. 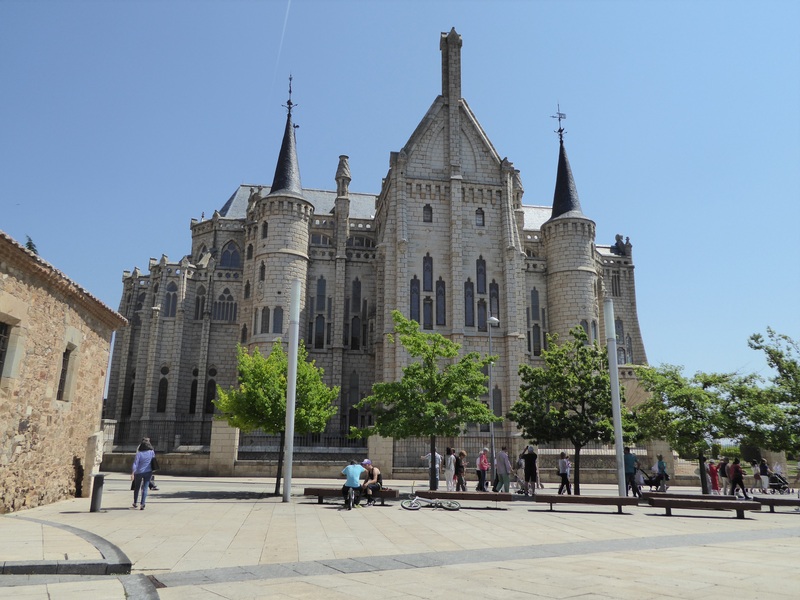 The second is from Burgos to Astorga, known as the Meseta or great plain. The Meseta offers the pilgrim a mental challenge. This is where ” Jerusalem Fever” may occur. 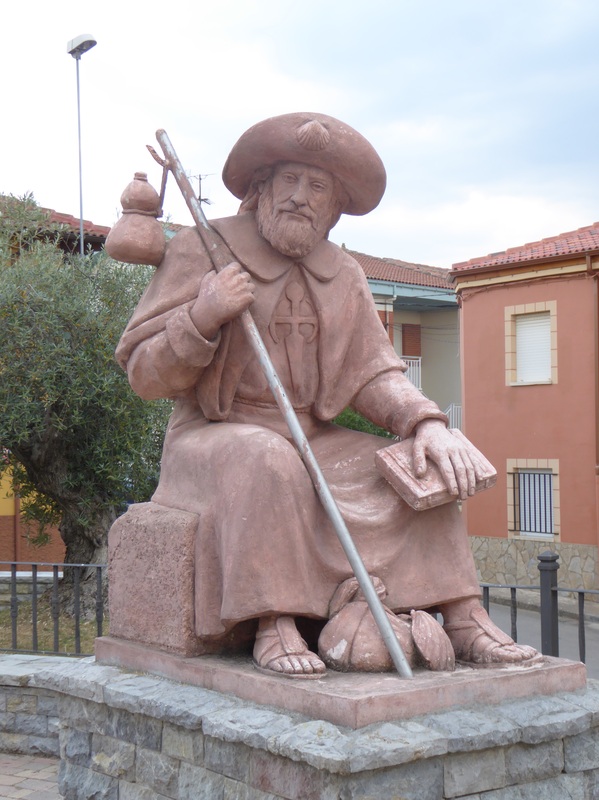 Actually, a friend of ours who walked the Camino from Burgos to Santiago, said he felt the presence of, but did not see, an ancient pilgrim accompanying him all through the Meseta…. He is a very grounded person, not a man prone to exaggeration or fantasy…. The final portion of the Camino is from Astorga to Santiago through two mountain ranges into Galicia. This is believed to be the pilgrim’s spiritual challenge. We are very much looking forward to the next few weeks. This shows the Cathedral on the left with Gaudi’s building on the right. Look closely and you will see terraced planters with flowers in the foreground. We expect that you will see those again…. Really just a series of smaller oval planters fitted on top of each other with a watering system working top down. We love the idea and will try to copy the planter idea. Magnificent entry doors to Cathedral. 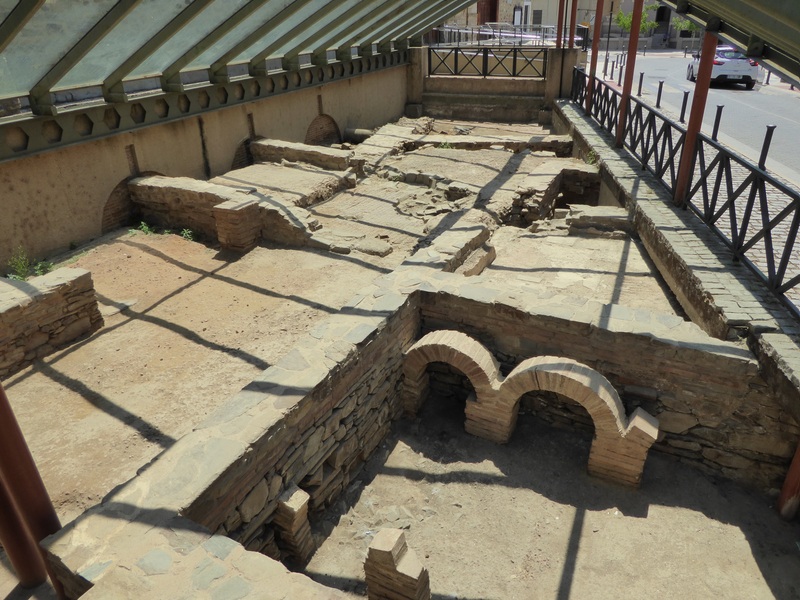 Excavation of Roman buildings in Astorgia which showed remarkable engineering: including heated water and heated floors, a sewer system, separate areas for spas, cooking and sleeping. A Gaudi engineering marvel — very controversial and so far ahead of it’s time, yet functionally perfect and artistically unique!